There’s nothing quite as fun as including your pup in all of your favorite Halloween festivities. (Costume contest anyone?) And this October happens to coincide with the release of new tasty treats (no tricks!) from The Honest Kitchen. 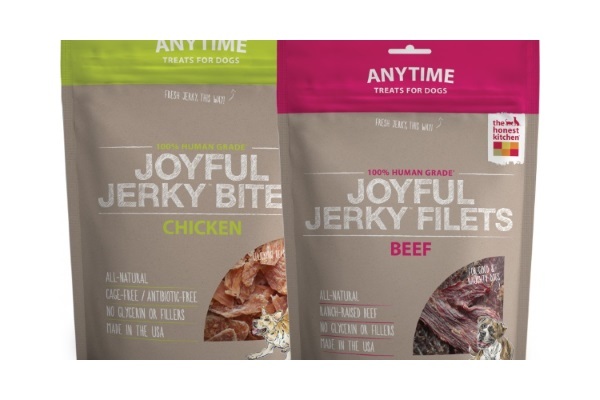 Now, pups get to gobble up 100-percent human grade Joyful Jerky Filets and Bites in four different chicken and beef flavors ($12.99-$14.99). Made with ranch-raised beef and all-natural chicken breast, these delicious treats are minimally processed and free of fillers, by-products, sugars, and other bad-to-the-bone stuff that doesn’t belong in our dogs eat. Alongside helping pet parents provide their pups with nutritious noshes, The Honest Kitchen is a standout brand for being committed to selling its products only to retailers who host adoptions and work with local rescue groups. So puppy mill-fed shops can’t carry Honest Kitchen stuff. In fact, the Humane Society of the United States has recognized the company for being part of the “humane economy” in this way. And if you’re interested in whipping up some homemade edibles for your furry friends, you can find 45 recipes in The Honest Kitchen CEO and founder Lucy Postins’s new book, Dog Obsessed ($22.99), which has tons of other tips on caring for your dog throughout the year. The post Treat Your Dog With These New Jerkies From The Honest Kitchen appeared first on Dogster.